So My latest adventure with the Arizona Backpackers Club (ABC) too me to Sycamore Canyon which is just west of Sedona. It has all the beauty of Sedona without all the people/homes/roads. 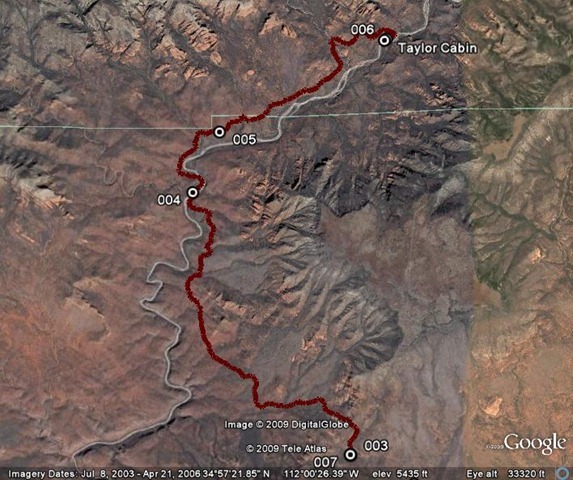 Sycamore canyon has been noted as one of Arizona’s great backpacking trips. And I would fully agree with this. We camped at the trail head on Friday night. Saturday morning we got up and headed down into the canyon. The trail down in and up to the cabin is 10 miles each way with an elevation loss/gain of 1,750 ft. We stopped at the crossing of Sycamore Creek and took a break for lunch and waited for everyone to catch up. After this we headed the remaining miles up to Taylor Cabin. When we pulled into Taylor cabin there was already someone there. There was this older guy sitting there with a Dog (That obviously really didn’t like me). The guy reminded me of what you would think of a typical hermit. I guess this guy has been coming up to the cabin a few times a year for the past 25 years! After talking to him a bit Lucky asked if we could look around in the cabin. I was really cool inside and had a fireplace, stove, table, some canned goods, and other misc stuff. The cabin was built with one side being a large boulder. Up the side of the boulder came this crooked chimney. After leaving the guy to himself and the barking dog we headed towards the river and set up camp under a grove of trees. Then we gathered firewood, filtered our water, set up tents and the like. Bonnie made our fire and had been designated the fire keeper for the night. In the morning we woke up to quite the surprise. The Creek that was previously dry was raging in the morning. The water level in the pool we had filled our water up the previous day had risen at least three feet. The heat from the day before must have melted quite a bit of snow. We all thought we were going to have to cross the creek on the way back. But lo and behold the creek was just as dry as the day before. The water must have either gone underground or filled up other ponds. After everyone had made it back to the vehicles we headed to Old Town Cottonwood for some beer and Mexican food. I’ll find the name of the great restaurant we ate at later and post it here. Really nice shots, I especially liked the camp fire shots, great light.